What are Genes and DNA? The estimated number of cells in the human body ranges from 5 billion to 200 trillion (1). In the nucleus of each cell there are 23 pairs of chromosomes, i.e., a total of 46 chromosomes. Each chromosome is comprised of tightly-coiled DNA. DNA, or deoxyribonucleic acid, is the hereditary material of all living organisms. The information in DNA is stored as a code consisting of four chemical bases that are pair-wise linked: adenine (A), guanine (G), cytosine (C) and thymine (T). The order, or sequence, of these base pairs determines the information available for building and maintaining an organism. Human DNA consists of about 3 billion base pairs, and more than 99 percent of those are identical in all people. A gene is the basic physical and functional unit of heredity. Genes are a region of DNA that act as instructions to create molecules called proteins. In humans, genes vary in size from a few hundred to more than 2 million DNA base pairs. The Human Genome Project has estimated that humans have between 20,000 and 25,000 genes. A genome is the complete set of DNA of an organism. An important property of DNA is that it can replicate, or produce copies of itself. Each strand of DNA in the double helix can serve as a template to duplicate the sequence of the bases. This is critical when cells divide because each new cell must have an identical copy of the DNA present in the old cell. How are Proteins Produced in Cells? 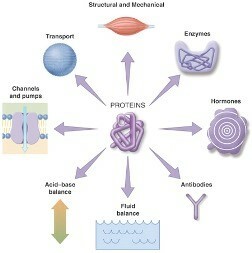 Information concerning protein synthesis is stored in the DNA inside the nucleus. The information from the DNA is copied to mRNA (transcription). 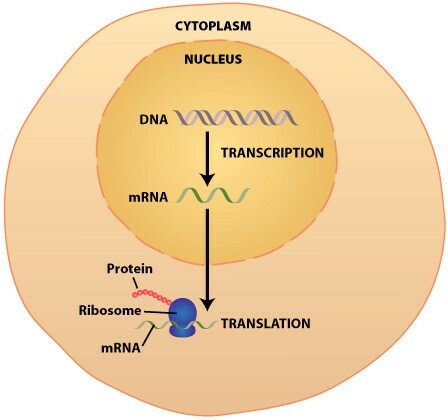 The mRNA leaves the nucleus and transports the information to the ribosomes in the cytoplasm. The proteins are generated at the ribosomes (translation).